We have a Sunday morning tradition around our house. We sleep in (the only day we REALLY get to), Munchkin watches PBS, Regina reads the paper (cover-to-cover), and I make waffles. 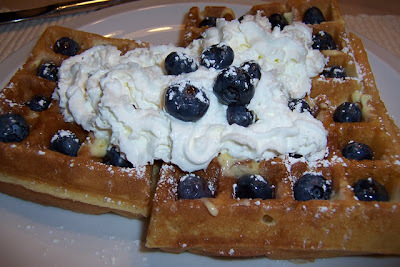 But not just waffles... my special waffles. 4 Tbsp unsalted butter, melted but not hot. Pour the melted butter into a medium mixing bowl (an 8-cup Pyrex measuring bowl works great because you can melt the butter in it to start.) Whisk the eggs, one at a time, until thoroughly beaten. CAUTION: Be sure the melted butter is not too hot, we don't want the eggs to cook... yet. Drizzle in the milk and whisk until combined. Add the dry mixture, all at once, to the wet mixture*, and stir to combine, but don't over beat. Really, don't worry about the lumps... they cook out. Set aside for a few minute to prep the waffle iron. The rest will let the baking powder start to do it's thang. Plug your waffle iron to preheat it. Set it at the brown-ness level of your choice. Frankly, these things only need two settings: off and full-on. Check you iron's owner's manual (you still have it, right? right?) to determine the batter-capacity. Ours holds one cup of batter, so to make it easier, we employ our 1/4 C. ladle (also great for pouring pancakes and ladling, well, ladley things). When the iron tells you it's ready, and most models will, load it up and clamp down the lid and wait for "all done" signal, be it ding, buzz or blink. Remove the waffley goodness to a place and ship it IMMEDIATELY to the table... or feel the wrath of a little boy who LOVES his waffles. If you decide to make a bunch and serve them all at once, just place the waffles on a wire rack, nestled in a 1/2 sheet pan, cover the lot with aluminum foil in a pre-heated 200°F oven. *Yes, I know, I know, most recipes like this use the 'muffin method', where the wet is added to the dry. I choose the reverse because at 7AM on a Sunday morning, I'd rather shake out dry than scrape out wet. 'Round these parts, we're partial to butter and good maple syrup. Notice I said 'good maple syrup', you know the REAL stuff. Yes, earlier in life I was smitten with the curvy temptress in brown glass with her sugary sweet goodness, but have since seen the errors of my ways. I'm a real maple syrup guy now, be it medium or dark amber grade. As I said before, Boomper loves waffles, so we always try to freeze a few from each batch. Wrap them tightly with plastic wrap (Press 'n Seal freezer wrap works great for this) and store in a freezer zip top bag. Don't worry about how long they'll last in the freezer... they won't last that long. So, did you get all of that? I hope you like 'em! Sounds delish! Can you send some of the leftovers down here??? Real butter, real maple syrup... wow, my kind of waffles! Is that griddle still hot? I'm coming over!